Welcome to West Coast Coins! We specialize in quality US coins with a strong emphasis on seated liberty coinage! We typically list 50 to 100 new coins up every week. Come check in with us weekly as we will always be listing new items. 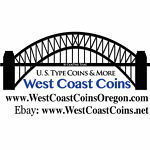 Come visit our raw Ebay store named WestCoastCoinsOregon2 !